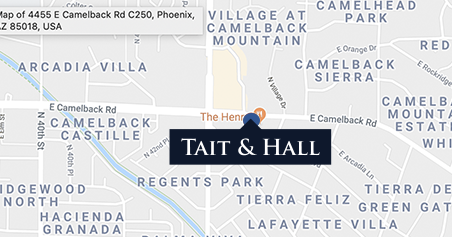 At Tait & Hall, getting your case dismissed is our TOP priority. Our Arizona criminal defense team consists entirely of former prosecutors. This unique experience gives us the edge in understanding the tactics prosecutors use and how to attack and defend against them. Our Arizona defense attorneys have secured acquittals in a wide variety of criminal cases, ranging from petty offenses and DUIs to serious felonies. No matter how simple or complex the case, Tait and Hall offers the experience, track record and passion that produce results. Contact us to schedule a free consultation with one of our qualified Arizona criminal defense attorneys and let us start fighting for you or your loved one today. A DUI conviction can result in costly fines, loss of driving privileges, jail time and damage to your reputation. DUI charges are among the most common types of charges filed in Arizona, yet are also among the most complicated to defend. Our experienced Arizona DUI attorneys have fought countless Arizona DUI cases, and won. You don’t have to face the complexities of DUI charges alone. Let our team of successful Arizona DUI defense attorneys put our proven defense strategies to work for you. How Is A DUI Defined Under Arizona Laws? What Is The Shelter Rule Defense In Arizona? What Will Lead To A Successful Outcome In A DUI Case?